The Big Mo. No, I'm not talking about Nigel Mansell. Or Keke Rosberg for that matter. Or even Harald Ertl (Google him. Really, you won't regret it). I'm talking about the intangible yet large-scale sense of momentum that can be established, whether it be in social shifts, politics, sport or anything else. And once it is established it can be very hard to halt let alone reverse. In F1 right now, Keke's son Nico one way or another seems to have established it. And this weekend around the Red Bull Ring in Austria it continued. It was by no means a classic weekend for Nico; a messy qualifying (one way or another) meant that he started a mere P3. In the race he didn't look much of a threat to the Williams ahead in the opening stint, and when he got ahead he didn't ever look like running away. He also came close to giving Williams the lead right back at mid-distance by running off the track at turn one. But he remained resolute both then and throughout - a skill that he's displaying in abundance this campaign, far from the former 'Britney' moniker - and most importantly by the end he remained in the lead. Oops he did it again. 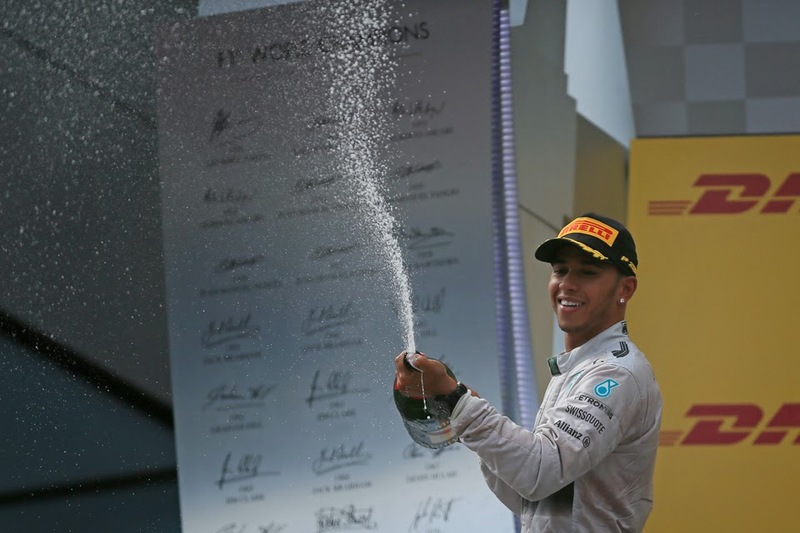 And now his championship lead over his team mate and sole rival Lewis Hamilton is an ever-more vast 29 points. Overturning that already looks like a big job. To underline this point, so long as Nico stays out of trouble (both personally and mechanically) and Merc continue to bag one-twos even if Nico follows his team mate home everywhere Lewis still wouldn't lead the table until after our autumnal visit to the Royal Park in Monza. It was a race that confounded the expectations in advance of many. 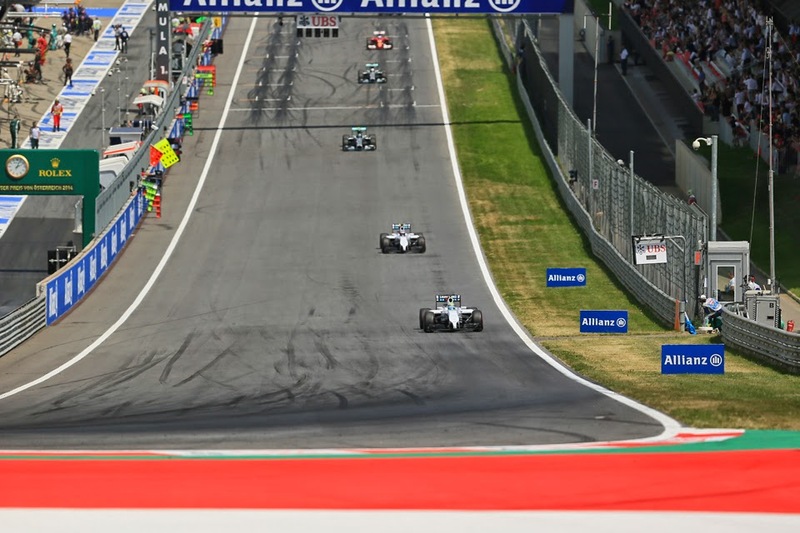 The much anticipated Williams tyre woes didn't really manifest themselves, and the two with Massa ahead led the pack in fine style for the first stint. It was just like old times. However the Grove pit wall seemed oddly slow to react to Rosberg pitting first time around - word had it that Williams was instead determined to 'run its own race'. Whatever was the case though the top four of two Williams then two Mercs who'd run in close company for the early part was close to reversed by the opening stops, with Nico clearing both FW36s and Lewis Hamilton managing to dive down the inside of Massa at turn two from what seemed several miles back just after the pole man had emerged from his own stop, to claim P3 behind Valtteri Bottas. Ah Lewis, who lest we forget started down in P9. But he got himself into the front-running mix almost before you could blink, with immense bravery and aggression on lap one. He was P5 in advance even of reaching turn two, and then he gobbled up Fernando Alonso at the fast turn eight before the opening tour was out. This didn't confound expectations as such, but perhaps even the greatest Lewis acolyte will have been taken aback by the double-quick nature of it all. Lewis managed to clear Bottas finally at the second stops (both of his pit halts were tardier than Nico's - further grist to the conspiracy theory mill apparently but both as outlined by Mercedes explainable) and left him with Nico in sight and a clear run at him. Both had to nurse brakes, but otherwise it was gloves off. These, combined with the fact that yet another seven-point net loss wasn't much good to Lewis, meant most donned their tin hats. But Nico deployed some preventative measures, managing to just about peg the gap that his team mate had to make up to him. By the end it was fairly close, but Nico still kept his foe out of striking distance. While Nico once again was ecstatic: 'It wasn't the easiest of races, trying to manage certain things which were a bit on the limit on the car, but I had a very fast car again, so it was fantastic to win today'. There's a long way to go of course, and things can change very quickly in this game. But do you ever get the impression that in this 2014 campaign that Nico is the one with the Big Mo? Another way in which expectations were confounded today was that, despite this being an ever-so familiar one two for Merc, and that some got a bit overexcited by the fact that the team's first non-win of the season in Montreal was followed by its first non-pole in Austria, still today was by far the closest the rest have got to the Mercs without the crippling mechanical woes experienced in Canada. By the end Valterri Bottas completed the podium and did so but eight seconds adrift of Rosberg, without safety cars or anything else. As Martin Brundle noted this equates to around a tenth per lap only. Perhaps with more of a toe-to-toe strategy with the Mercs he'd have been even closer. 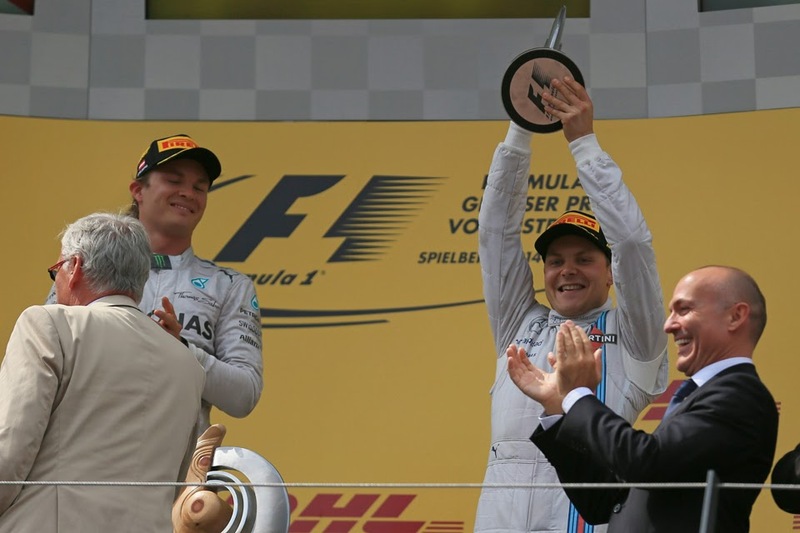 And not only did this result in Williams' first podium finish of the year, it also marked the first F1 podium ever for Bottas. Somehow both marks seem a little overdue. Massa meanwhile followed him in nine seconds later in fourth. Next up was the astonishing Fernando Alonso, who as usual pushed his car as fast as it would go for the entire distance, and clung to the top four's coattails as a consequence. For much of the way it looked like he may even get close enough to seize the scalp of Massa, though actually passing the swift-in-a-straight-line Williams would have been a challenge, and in the end even he had to give best. But as if to emphasise what Alonso personally is delivering to the Scuderia right now Kimi Raikkonen had another subdued and frustrated run, finishing a distant tenth. While it was anticipated that Red Bull Ring wouldn't suit the Red Bull, not even Cassandra herself would have predicted the extent of its struggles in actuality. Of the four Red Bull owned cars none were much of a factor and worse three of them conked out before the end - again including Sebastian Vettel who lost a lap early and then parked it partway through due to mechanical gremlins. Only Daniel Ricciardo made the finish, but running wide at the first corner meant he was swimming against the tide, and P8 was all he could do. He at least had the satisfaction of a fine ambush of Nico Hulkenberg on the final lap. 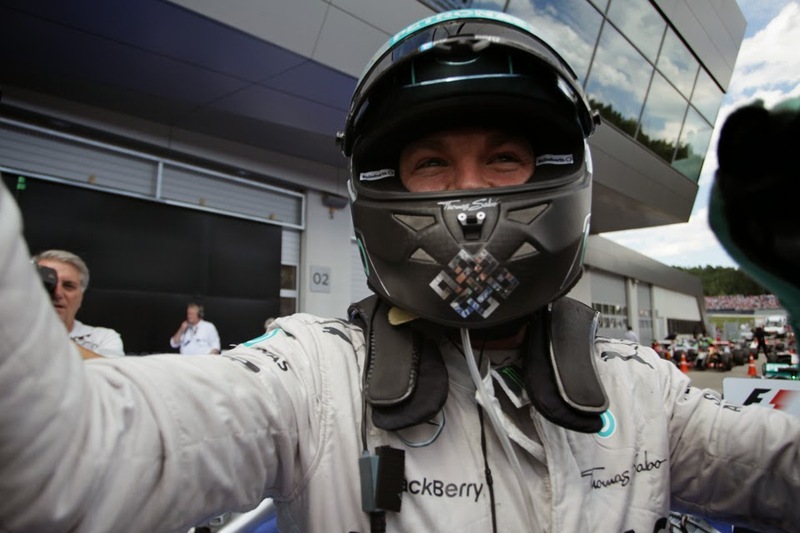 Nico Rosberg is one with more cause for satisfaction than most right now however. Probably even Nico would admit while being fully frank that he is shaded by Lewis when it comes to sheer pace and bravery (though the gaps aren't quite as wide on these as some foresaw). But right now he's added all up of his own attributes to total a clear drivers' championship lead. Somehow, and quickly, Lewis has to halt, and reverse, Nico's Big Mo.